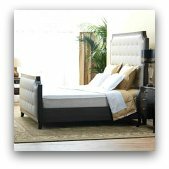 Sleep Innovations is the company responsible for the Novaform memory foam mattress. They produce two other major brands as well - Personal Expressions and Comfort Plus. Their products are sold at many big name retailers such as Sears, Target, Sam's Club, Costco and Kohl's. They've come out with many different models of visco foam mattresses over the past few years but one of the biggest sellers is the Novaform line found at Costco. 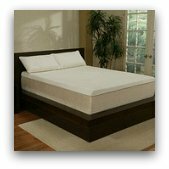 For an in-depth look at comments made by owners see Novaform Mattress Reviews. Chances are that by this point you probably know someone with a memory foam bed, and it's likely you have some idea of what they're like. Basically it's a type of foam that was created in the Sixties to develop better aircraft cushions, and was originally named temper foam by Charles Yost, it's creator. It's had many different applications since NASA released it into the public domain in the 80's, all the way from football helmet liners to pads for x-ray tables and other medical applications. Though it was kind of hard to work with at first, it's become a first rate material in the marketplace today. This is especially true when it comes to the bedding industry. If you've never used a visco elastic foam mattress, you might be wondering about the difference between this and any other type. The biggest difference you'll notice is that, unlike your standard spring based mattress, a memory foam mattress actually conforms to the shape of your body, and even changes with you as you move. However some are of poor design and will simply allow you to sink into the mattress. They are constructed of low quality materials or may not contain any memory foam at all in an attempt to make higher profits. A high quality memory foam mattress can last up to 20 years. Cheap imitations may seem alright at first but won't last very long. For this reason you really need to be careful when shopping for a new one. A lot of people buy a Novaform memory foam mattress because you can get them at Costco where you can return it anytime. The Novaform Elite memory foam mattress is the most basic model in the line. Like most it has two layers of foam. On top there's a three inch layer of memory foam and underneath there's a nine inch layer of conventional foam acting as the base. This is one of the best deals out there as far as visco foam mattresses go. It would make a great entry level bed for most people. The Novaform ComfortLuxe is a step up in the line and is one of their mid level models as far as price. It has a total of four different layers. The top layer is one and a half inches of Coolwave memory foam. This is one of their newer products and is supposed to address the problem of heat retention. Next is one and a half inches of high quality six pound density memory foam. Then there's two inches of five pound density memory foam followed by seven inches of regular foam providing support as the base layer. The Novaform Grande Elegance is their top of the line model and is the most expensive. It has a European design and a very plush quilted knit damask sleep surface. It also has four layers of foam but they are slightly different. On top is one inch of their new patented, premium density memory foam. Then there's three inches of high density memory foam underneath. Below this is one inch of their very resilient, recently patented open cell foam. It has a springy character and is meant to make the mattress more comfortable as well as more durable. This is only a few of the models in the Novaform memory foam mattress product line. They also offer many other products such as the Novaform Elite mattress topper and the Novaform Elite contour pillow. Many people choose not to buy a mattress at all but go with a Novaform mattress topper. Memory foam bed toppers are very reasonably priced and are sometimes just as effective. They could be a great way to try out the material and see if you like it.